3 Why Does Scarcity Work? 4 When Can It Backfire? Xiaomi is a Chinese mobile handset company which entered India few months back with a bang. Their marketing team has adapted a very interesting strategy: flash sales. The day Xiaomi launched their first model in India, more than 90,000 units were sold within 13 seconds. Their next launches received similar overwhelming response with thousands selling off the ‘online’ shelf in seconds (13,000 units sold in 5.3 seconds). Indian mobile consumers went berserk as the flash sale usually ended within seconds, with 4 out of 5 complaining that they couldn’t order their own unit. Some smart tech enthusiasts even created plugins and browser extensions for successful shopping of Xiaomi handsets! What made these fans so desperate for a mobile? This is a persuasion technique which has been verified time and again, and is often a sure shot way of success, if all the ‘conditions’ are prime. In this case, Xiaomi chose to sell their mobile phones only via Flipkart’s platform, and limited the window of sales for few seconds. They advertised and promoted with a punch line: only few thousand units available for sale. And this did the trick for them. Not only in India but even in matured markets of Singapore, Hong Kong, Australia and South Korea. Do you really think that a multimillion dollar company can’t afford to sell more than 10,000 units in a day? Or they don’t have the inventory to sell more? Human mind is wired in a peculiar way, and as I had shared earlier, facts and logic alone are not sufficient to convince the human mind to either sell or adapt a new thing. Scarcity is one such persuasion technique, which works despite all ‘logic’ going against it. Xiaomi created an artificial scarcity to produce real demand in the market, and such was the gigantic effect that people were actually complaining that they couldn’t get their hands on the specific ‘desired’ product! Two jars were arranged, and in one jar, scientists placed 10 cookies, and in the other jar, they placed 2 cookies. Students were asked to taste them and rate their experience. All the cookies were same in both the jars, hence theoretically, the taste rating should have been the same. But what happened next surprised the social scientists. Cookies placed in the first jar with 10 pieces received less ratings, compared to the 2 cookies placed in one jar. The jar with 10 cookies was perceived as ‘easily available’ to the respondents, hence less rating meanwhile the jar with only 2 cookies was perceived as ‘special’ and ‘privileged’ by the same people, hence more ratings. These cookies had a desire level more than the 10 cookies placed in the other jar. No complex logic out here, simple human minds functioning as per the default wiring here. Another observation which you may relate easier: Think about a time when you are sitting with a friend and having a decent conversation. Suddenly a new call arrives on your mobile from an unknown number: 8 out of 10 times, people will pick that call from the unknown number and ignore the friend who is sitting opposite. The reason is that the fear of loss in a human being is far greater than the joy of gain. When a person sees an unknown number calling, then the mind will convince that person to pick that call, otherwise he may lose the opportunity to take the call, forever. The friend who is sitting infront may wait, as he is not going anywhere else. The gain of talking with a friend suddenly becomes less important that the loss of missing that call. The same psychological process happens when a company or brand announces an offer which is only valid for a certain time. The loss of losing on that offer is far more influential than the gain of saving money on not going for that offer. The persuasion method of scarcity can fail if you don’t keep up your promise, and make the item available easily. The whole logic of this persuasion method is based on the fact that anything which is scarcely available is more desirable. Hence, if Xiaomi makes their handsets readily available, even after the flash sale ends, then their marketing strategy of scarcity will fail. In that cookie jar experiment, if the social scientists had provided equal number of cookies in both the jars, then there would be no scarcity, and the perceived value of cookies in both the jars would be same. Entrepreneurs can use this tactics to improve their sales and to create a special place within the hearts of their targeted audience. Overdoing it may again, backfire. There should be subtle way of using this persuasion technique, and the promises or conditions should be fulfilled to create a genuine scarcity condition. 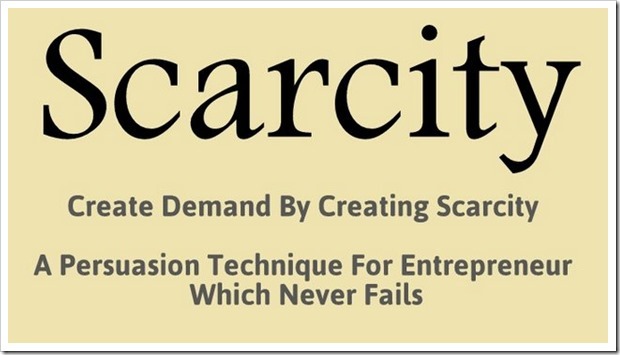 In the next post, we shall discuss some examples of ‘scarcity’ which actually happens naturally, and how can the entrepreneur take cues from these incidents, and create a robust strategy for his own products or services. And later, we shall discuss ways to avoid falling in the trap of scarcity, if you are the end consumer. Easy And Inexpensive Ways To Create A Mock-up For Your Startup Idea! But Xiaomi had good & competetive product as well, they couldnt have generated the hype if the product didnt have merit. Thanks for the comment, Ravi. But Xiaomi’s success is proudly shared across now the spectrum. Yes, management gurus oppose this strategy, but the results are speaking for themselves here! 3. Product will go out of market soon etc.